These are the first in Cliff™’s programmed series of USB and other data connectors, primarily in XLR and other industry standard shells. 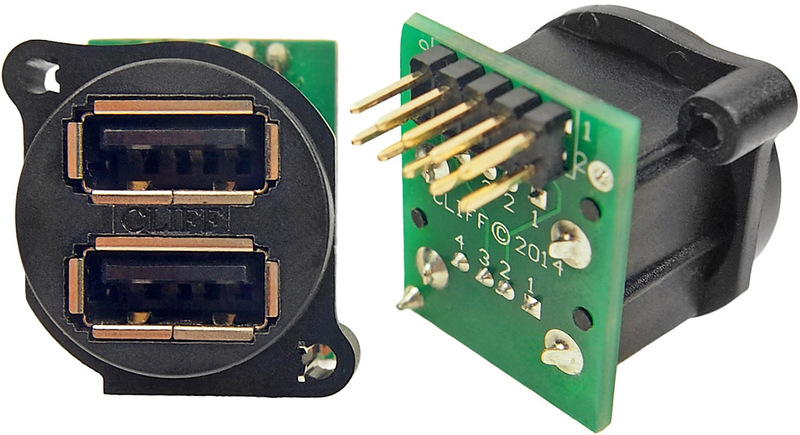 Please enquire to our sales department for customised USB connector variants to suit end user applications. Dual USB2 compliant sockets are mounted in a space-saving, single, universal XLR receptacle, chosen to allow industry standard panel cutouts and maximum panel mounting density. 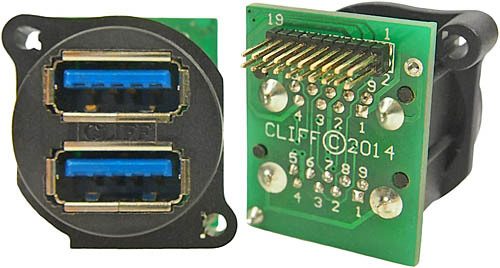 The two USB2 sockets provide isolated and independent output connections to two rows of 5 x 2.54mm (0.1”) pitch output pins. These are configured to facilitate either direct soldering to PCBs or connection by header cable. We are happy to provide customers with standard or custom designed header cables to meet individual system requirements. See the PDF data sheet for technical specifications. Dual USB Sockets in XLR shell - Series 5 (opens in a new window). Dual USB2 compliant sockets mounted in a space-saving, single, universal XLR receptacle. 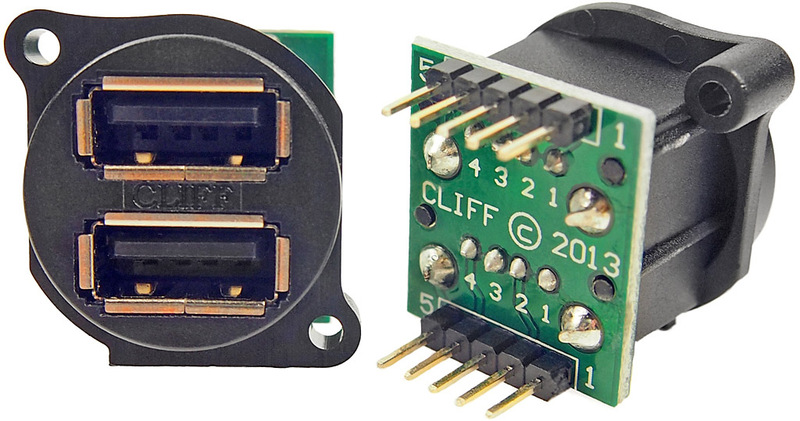 Dual USB3 compliant sockets mounted in a space-saving, single, universal XLR receptacle. Suitable for compatible connectors and ribbon cables. FCI Minitek 127 IDC receptacle 20021444-00020. Harwin 1.27mm contact pitch DIL IDC ribbon cable connector M50-3301042. 3M round conductor flat ribbon cable 3756/20 (0.025″ conductor wire spacing, 30AWG, stranded, TPE). 3M round conductor flat ribbon cable 3609/20 (0.025″ conductor wire spacing, 30AWG, stranded, FEP).